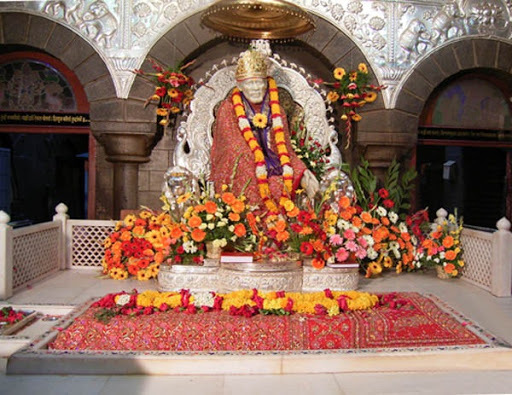 If you are planning to visit Shirdi the holy pilgrimage of Maharashtra remember to visit a few important places, which kept prime importance in the life of Shri Sai Baba. They are Samadhi Mandir, Dwarkamai mosque, Gurusthan and Chavadi. Sai’s life appears to be an unsolved mystery. His mysterious life started from his first appearance in Shirdi when he was first seen in 1858, but disappeared after a while. Upon his return he started staying under a neem tree on the outskirts of the village. After a few days he started leaving in an abandoned mosque. This mosque is nothing else but Dwarkamai in Shirdi. With the news of a fakir staying on the boundaries of the village people from nearby villages started visiting him with serious health problems. 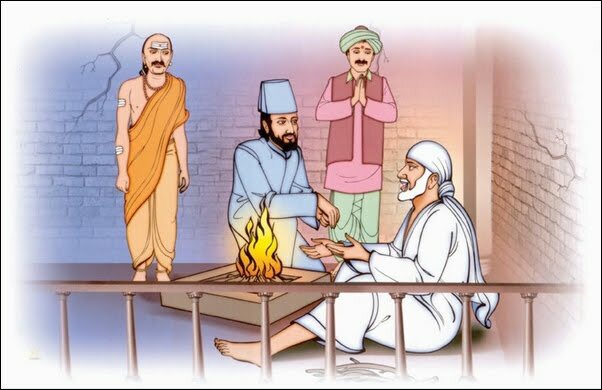 Sai used to give them some herbal remedies and Udi or sacred ash from his Dhuni, which was a continuously burning sacred fire. This miraculous healing power of the fakir made him more popular in the surrounding region and was gradually accepted by the people as well as the Khandoba temple priest. In the later days he made Dwarkamai mosque his permanent residence. 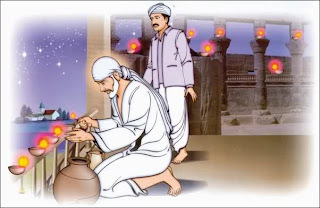 With passing days people of Shirdi and nearby region started having deep faith on Sai and they interpreted him as their savior in difficult times. Sai stayed in the mosque till the end of his life. The mosque is located to right side of the entrance of Samadhi Mandir. This place is where the great saint offered solutions to problems faced by his devotees. Baba used to give them sacred udi which miraculously solved the deep rooted diseases of the people. This was possible only because of the divine powers of the saint. It is believed that simplicity of the Shirdi mosque attracted the fakir who never believed in lavish lifestyle and running after maternal happiness. By staying in mosque and having disciples of both religions he taught his followers that principle of humanity is above all the religions. One must believe in god at the same time keep brotherly hood with everyone. Another simple principle he taught was belief and patience. Even after his mahasamadhi devotees believe that Sai’s grace and blessings still exist in Shirdi and especially in the divine places like Samadhi Mandir, Dwarkamai mosque, Gurusthan and Chavadi. The Dhuni at Dwarkamai is still continuously burning. Never forget to visit these sacred places whenever you are visiting Shirdi. 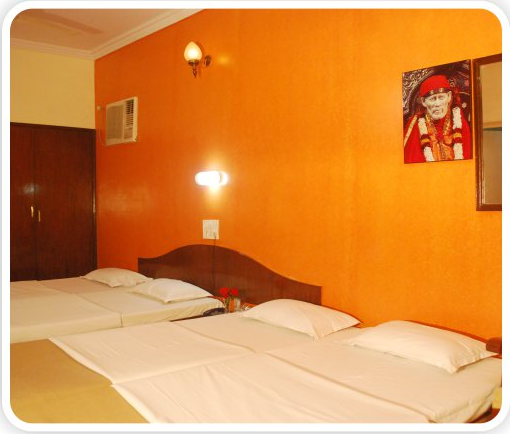 Samadhi Mandir is one of the topmost attractions of Shirdi. 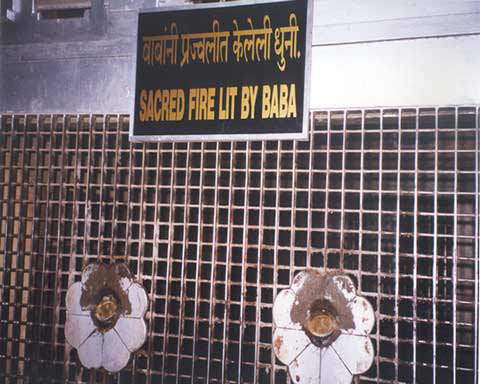 Sai Baba’s Samadhi is built with marble stones surrounded by a railing of marble adorned with explicit decorations. Two pillars beautifully decorated are facing the Samadhi. Behind the Samadhi Sai Baba’s incredible marble statue shows him in a seating position. Shirdi was dipped in sorrow when the news of mahasamadhi of Baba spread across the town on 15th October 1918. Baba gave up his body and left for a heavenly abode. This day is celebrated as Punyatithi of Shri Sai Baba. It was the auspicious day of Vijayadashmi for the Hindus. 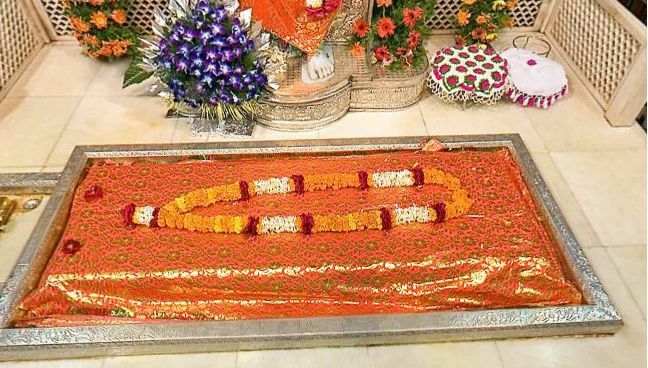 The body was buried by early Thursday morning and a photograph of Sai was placed on the platform of the tomb till the statue was installed in 1954. This photo is now kept at the back of the Samadhi Mandir along with some other belongings of Sai. Samadhi Mandir is the most important shrine in the Shirdi temple complex. Samadhi Mandir is supposed to be the place where Baba promised to be active even from the tomb. Baba’s presence is still experienced by the devotees in the Samadhi Mandir when someone glances at Baba’s statue. It seems that Baba is saying my blessings will always protect you. The statue of Sai topped by a silver umbrella was installed on 7th October 1954. There is an assembly hall in front of the statue where around five hundred devotees can gather. The showcase on the side displays things used by the saint. Just above the statue there are pictures of Baba during different incidents of his life. The temple opens early in the morning at 5am with devotional morning songs called Bhoopali. It is open for darshan throughout the day and closes by 10 pm in the night with a Shejarati. On the occasion of three important festivals of Shirdi Samadhi Mandir is kept open throughout the night. Thursday is supposed to be the best day when palki with baba’s photo is taken out from the Mandir. Make arrangements of your darshan of Samadhi Mandir prior your visit to Shirdi, so that you can spend some auspicious time in the Samadhi mandir and get blessings of Sai. Visit to holy place Shirdi is said to be incomplete if you are not visiting Dwarkamai and Chavadi after visiting Samadhi Mandir. 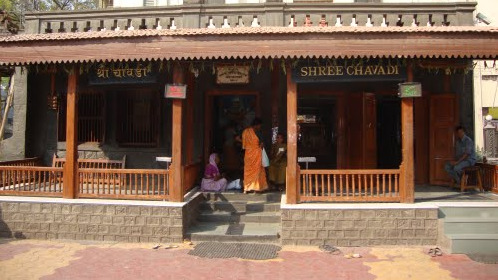 Chavadi in Shirdi conveys lot of importance to Sai devotees. This Chavadi originally was a place for conducting village meetings, acted as an office for storing village records and even it was used as a court where village disputes were settled by the heads of the village. It was also the place where taxes were collected. This place of village happenings became the home for Shri Sai till his mahasamadhi. Earlier Baba used to spend most of his time in Dwarkamai but after one particular incident Baba started spending alternate nights in Chavadi. From the two chavadis, south Chavadi is the place where Sai Baba used to sleep on alternate nights and presently all the Sai devotees go for his darshan. 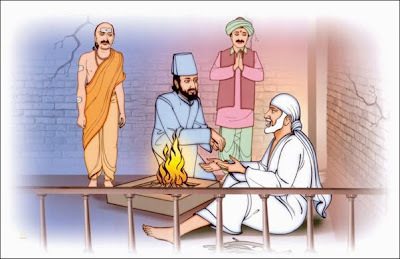 During Sai’s stay at Chavadi it became customary to offer aarti on his arrival from Dwarkamai. This became popular as the sej aarti. After Baba's mahasamadhi the Sai Sansthan acquired Chavadi, and until the late 1930s, used it for storing books and accommodating pilgrims. Afterwards the village offices were relocated and Chavadi became the place of worship for Sai devotees. The Chavadi is divided into two parts. One part of the Chavadi has a large portrait of Baba along with a wooden bed, a white chair and a big stone on which Baba used to sit. This portrait has a small story behind it. After his mahasamadhi in the year 1953, Sai appeared in the dream of a eighteen year old young man Ambaram, who was staying at Nausari in Gujarat, Ambaram made Sai baba’s portrait from what he saw in the dream. The villagers inspired by this event framed the portrait brought it to Shirdi and handed it to Shirdi Sansthan. This is the same portrait which we see in Chavadi today. There are many such incidences in which Sai Baba blessed his disciples. Such incidences in the life of Shri Sai baba increased the faith of his devotees. Whenever you visit Shirdi do not forget to visit these places like Chavadi which keep importance in the life of the great saint of Maharashtra. 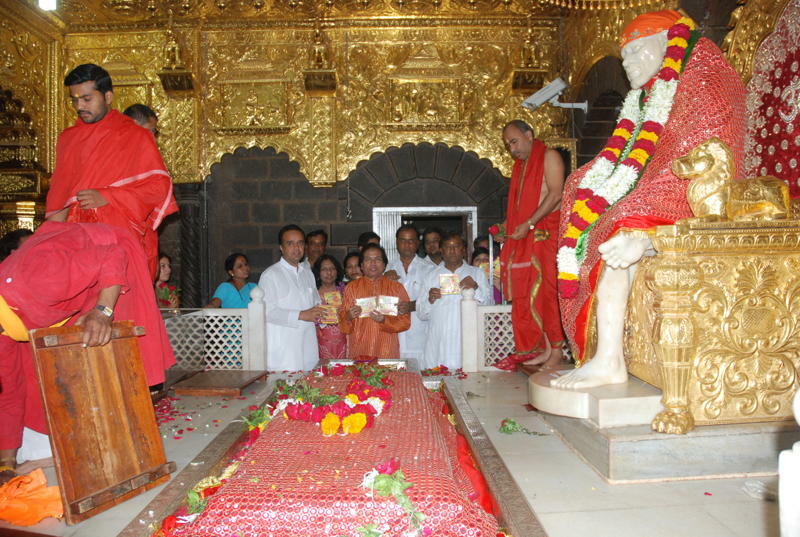 Shirdi is always filled with spiritual fervor and is dipped in grace and blessings of Sai. Sai Baba himself told his followers, one who comes to Shirdi with devotion will never turn back with empty hands. This spiritual abode of Sai adheres to many traditions like "daily offerings by Abdul Baba and Boraoke families", "palaki procession every Thursday", "jholi parampara in mahasamadhi", "ramanavami" and “urs tradition". These traditions preserve either a spiritual or humanitarian background. Among above traditions Palki procession at Shirdi every Thursday carries more importance. 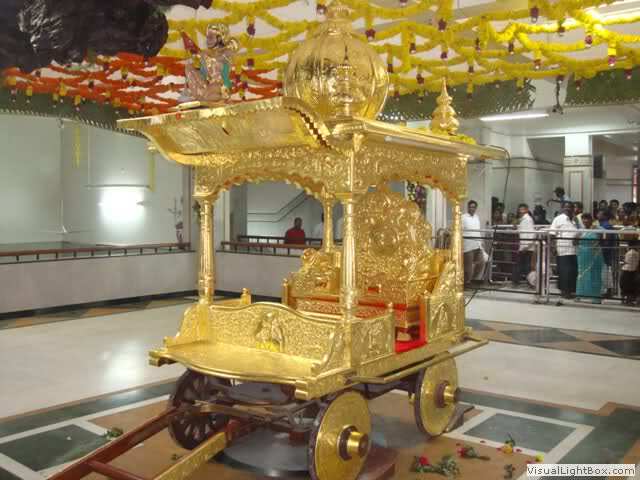 This ‘Palki’ procession starts from Samadhi Mandir which is eternal abode of Shri Sai, proceeds to Dwarkamai and then it moves to Chavadi. From Chavadi it returns back to Samadhi Mandir. This tradition has roots in those days when Shri Sai used to live here. From the year 1910 when Sai Baba was living in Dwarkamai Masjid, he used to sleep in Chavadi. His visit to Chavadi was accompanied by a Palki procession with all dignitaries including Tatya Kote Patil. Here are a few details of present day Palki procession. 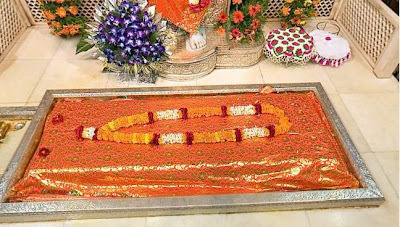 Prior to the “Thursday Palki” at around 8.00 PM Sai’s old portrait wrapped in a Royal robe, sacred staff and sacred Paduka kept in a silver plate are placed on throne at the Samadhi to be viewed by devotees. At around 9.00 PM followers of Sai gather in main hall of Samadhi mandir and sing devotional songs like bhajans and abhangas. At 9.15 the procession starts from Samadhi temple carrying Baba’s portrait held under a big umbrella, sacred staff and paduka. Priest carrying lighted incense leads this procession. As per tradition honor of holding portrait of Sai Baba goes to members of Tatya Kote Patil’s current generation family members. Since many years Thursday is considered to be most important day of worship. Many devotees reach Shirdi on Wednesday, so that they can attend early morning Kakad aarti on Thursday. Visit this destination on the eve of Thursday, so that you can attend early morning aarti as well as “Palki in Shirdi”. Be any occasion devotees flock to Shirdi to seek blessings of Sai Baba. 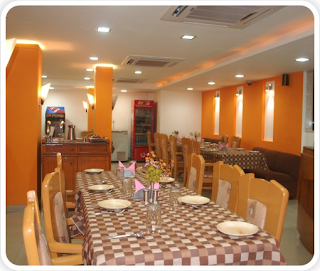 Diwali 2012 would be no different and we are expecting lots of people to visit Shirdi during this time. Diwali is celebrated to mark the triumph of good over evil. Is there any better way to start your celebration than to seek blessings from the Lord? Let us briefly describe the reason of celebrating Diwali. Diwali is also known as “Festival of Lights” and it commemorates the return of Lord Ram to Ayodhya with his wife Sita and brother Laxman after his 14 years of exile. It was during these years Lord Rama defeated the demon king Ravana. To celebrate their return and the victory over King Ravana, people in Ayodhya illuminated the entire village with earthen lamps. The lamps filled with oil are enlightened to signify the triumph of good over evil. This year we celebrate Diwali on 12th November 2012. Across the country you would see people decorating their houses with varieties of illuminated lanterns. Over the years, Diwali has been strongly associated with pollution. It is true that bursting of crackers pave way to sound and air pollution. In recent years, manufactures of crackers have come up with eco friendly crackers which emit fewer amounts of smoke and noise compared to traditional crackers. It is advisable if you are celebrating Diwali make sure you go for eco-friendly crackers as it would be less harmful to you and your planet. From the entire team of Sai Sahavas, we wish each and every one of you a "Safe and Happy Diwali."